Tides are everything on the outer shores. The stump in this photo is inundated during the highest tides. I took this photo just after low tide on May 1st, 2011. Low tide that morning was -0.1′. The beach is expansive at low tide. I think of any tide over 9′ as kind of high. At tides this high you can run out sand wherever the beach is narrow. 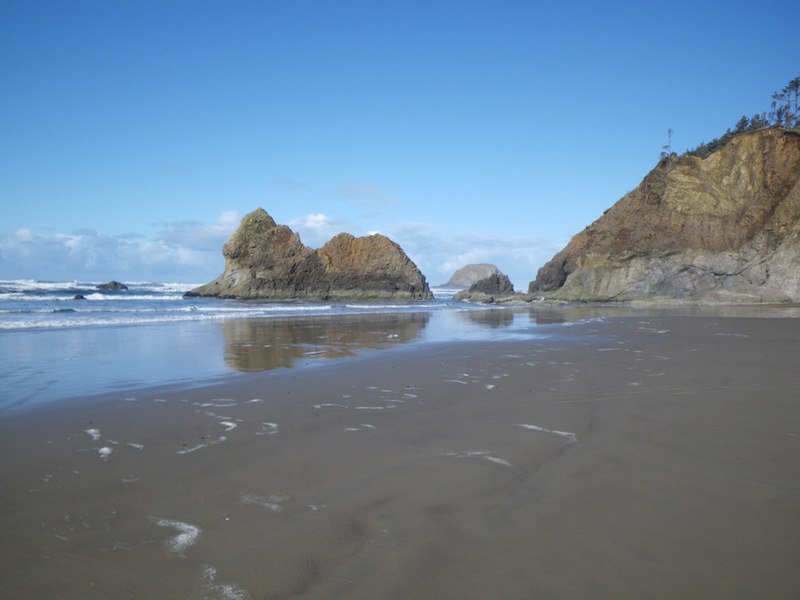 I’ve been on the beach for tides as high as 10.1′ (November 15, 2008) and 10.4′ (January 10, 2009). On the other hand, we sometimes experience some very low high tides. Any tide much lower than 6.5′ is a pretty low high tide. The lowest high tides I have experienced on the outer shores have been 5.9′ (November 25, 2009), 5.8′ (August 1, 2009) and 5.7′ (August 12, 2008 and February 16 and May 3, 2009). Tide predictions are a great planning tool. It’s all about tides on the outer shores. I like to explore the beaches during the incoming tide, so what I’m most interested in is high tide and the low tide that precedes it. 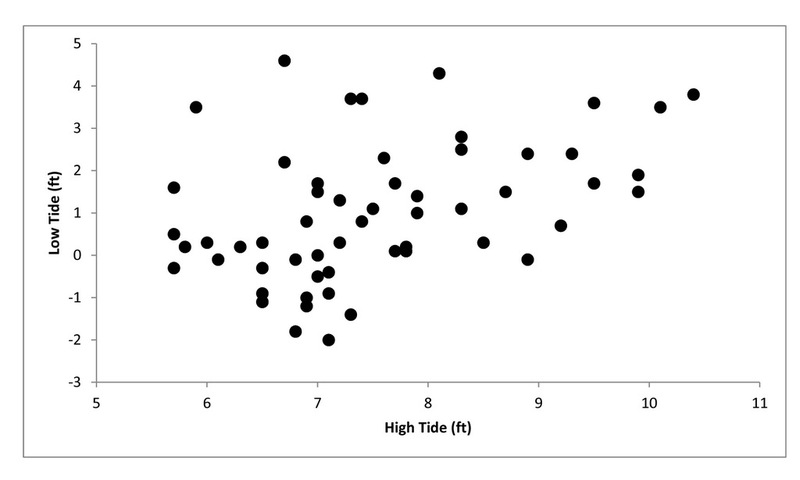 The graph above shows the relationship between high tide and the preceding low tide. There is quite a bit of scatter, indicating that high tide is not a good predictor of the preceding low tide. One of the reasons I care about the relationship between the two tides is it tells me about the swing I can expect. 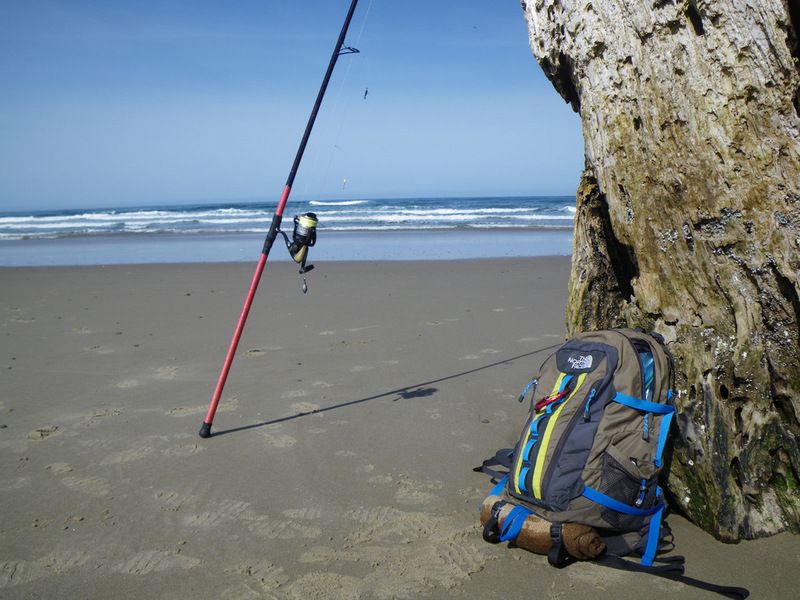 Swing is the difference, in feet, between high and low tide. Swing is one of the factors that determines how strong the up the beach surge is and how likely it is that I’m going to get wet or even knocked over if I’m not paying attention. Since I’m usually exploring during an incoming tide I care about the swing between a future high tide and the low tide that precedes it. I took this photo on November 9, 2009. Low tide was 2.2′ and high tide was 6.7′. The swing was an accommodating 4.5 vertical feet. Swings over 7′, in combination with other factors such as swell, can produce a nasty surge. What does “-0.1′” mean? negative 1.2 inches? from some standard baseline tide? ignorance abounds, again. Hi Megmi, you are right on. I wish I could tell you more about what 0 is; maybe I’ll check it out and let you know in a future post. The minus tides, of course, are lower and expose creatures that normally live under water. People like to go tidepooling on minus tides.